Anthem: "Oʻzbekiston Respublikasining Davlat Madhiyasi"
Uzbekistan (US: /ʊzˈbɛkɪstæn, -stɑːn/ ( listen), UK: /ʊzˌbɛkɪˈstɑːn, -ˈstæn/; Uzbek: Ўзбекистон/Oʻzbekiston pronounced [ozbekiˈstɒn]; Russian: Узбекистан [ʊzbʲɪkʲɪˈstan]), officially also the Republic of Uzbekistan (Uzbek: Ўзбекистон Республикаси/Oʻzbekiston Respublikasi; Russian: Республика Узбекистан), is a landlocked country in Central Asia. The sovereign state is a secular, unitary constitutional republic, comprising 12 provinces, one autonomous republic, and a capital city. Uzbekistan is bordered by five landlocked countries: Kazakhstan to the north; Kyrgyzstan to the northeast; Tajikistan to the southeast; Afghanistan to the south; and Turkmenistan to the southwest. Along with Liechtenstein, it is one of the world's only two doubly landlocked countries (i.e. sharing borders only with other landlocked countries). Uzbekistan has a diverse cultural heritage due to its storied history and strategic location. Its first major official language is Uzbek, a Turkic language written in the Latin alphabet and spoken natively by approximately 85% of the population. Russian has widespread use as a governmental language; it is the most widely taught second language. Uzbeks constitute 81% of the population, followed by Russians (5.4%), Tajiks (4.0%), Kazakhs (3.0%), and others (6.5%). Muslims constitute 79% of the population while 5% of the population follow Russian Orthodox Christianity, and 16% of the population follow other religions or are non-religious. A majority of Uzbeks are non-denominational Muslims. Uzbekistan is a member of the CIS, OSCE, UN, and the SCO. While officially a democratic republic, by 2008 non-governmental human rights organizations defined Uzbekistan as "an authoritarian state with limited civil rights". Following the death of Islam Karimov in 2016, the second president, Shavkat Mirziyoyev, started a new course, which was described as a A Quiet Revolution and Revolution from Above. He stated he intended to abolish cotton slavery, systematic use of child labour, exit visas, to introduce a tax reform, create four new free economic zones, as well as amnestied some political prisoners. The relations with neighboring countries of Tajikistan, Kyrgyzstan and Afghanistan drastically improved. However, the Amnesty International report on human rights in the country for 2017/2018 described continued repressive measures, including forced labour in cotton harvesting, and restrictions on movements of 'freed' prisoners. The Uzbek economy is in a gradual transition to the market economy, with foreign trade policy being based on import substitution. In September 2017, the country's currency became fully convertible in the market rates. Uzbekistan is a major producer and exporter of cotton. The country also operates the largest open-pit gold mine in the world. With the gigantic power-generation facilities of the Soviet era and an ample supply of natural gas, Uzbekistan has become the largest electricity producer in Central Asia. Renewable energy constitutes more than 23% of the country's energy sector, with hydroelectricity and solar energy having 21.4% and 2% respectively. Map of Uzbekistan, incorrectly including the former Aral Sea. Uzbekistan lies between latitudes 37° and 46° N, and longitudes 56° and 74° E. It stretches 1,425 kilometres (885 mi) from west to east and 930 kilometres (580 mi) from north to south. Bordering Kazakhstan and the Aralkum Desert (former Aral Sea) to the north and northwest, Turkmenistan and Afghanistan to the southwest, Tajikistan to the southeast, and Kyrgyzstan to the northeast, Uzbekistan is one of the largest Central Asian states and the only Central Asian state to border all the other four. Uzbekistan also shares a short border (less than 150 km or 93 mi) with Afghanistan to the south. 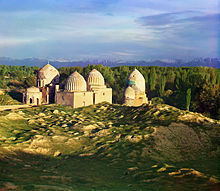 Uzbekistan has a rich and diverse natural environment. However, decades of questionable Soviet policies in pursuit of greater cotton production have resulted in a catastrophic scenario with the agricultural industry being the main contributor to the pollution and devastation of both air and water in the country. The Aral Sea used to be the fourth-largest inland sea on Earth, acting as an influencing factor in the air moisture and arid land use. Since the 1960s, the decade when the overuse of the Aral Sea water began, it has shrunk to about 10% of its former area and divided into parts, with only the southern part of the narrow western lobe of the South Aral Sea remaining permanently in Uzbekistan. Reliable, or even approximate data, have not been collected, stored or provided by any organization or official agency. Much of the water was and continues to be used for the irrigation of cotton fields, a crop requiring a large amount of water to grow. 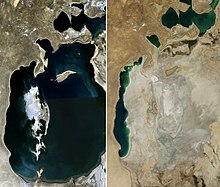 Due to the Aral Sea problem, high salinity and contamination of the soil with heavy elements are especially widespread in Karakalpakstan, the region of Uzbekistan adjacent to the Aral Sea. The bulk of the nation's water resources is used for farming, which accounts for nearly 84% of the water usage and contributes to high soil salinity. Heavy use of pesticides and fertilizers for cotton growing further aggravates soil contamination. According to the UNDP (United Nations Development Program), climate risk management in Uzbekistan needs to consider its ecological safety. 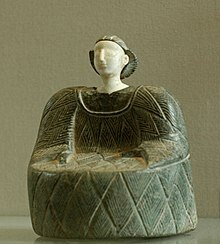 Female statuette wearing the kaunakes. Chlorite and limestone, Bactria, beginning of the 2nd millennium BC. 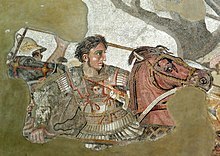 Alexander the Great at the Battle of Issus. Mosaic in the National Archaeological Museum, Naples. The first people known to have inhabited Central Asia were Scythians who came from the northern grasslands of what is now Uzbekistan, sometime in the first millennium BC; when these nomads settled in the region they built an extensive irrigation system along the rivers. At this time, cities such as Bukhoro (Bukhara) and Samarqand (Samarkand) emerged as centres of government and high culture. By the fifth century BC, the Bactrian, Soghdian, and Tokharian states dominated the region. As China began to develop its silk trade with the West, Persian cities took advantage of this commerce by becoming centres of trade. Using an extensive network of cities and rural settlements in the province of Transoxiana, and further east in what is today China's Xinjiang Uygur Autonomous Region, the Sogdian intermediaries became the wealthiest of these Iranian merchants. As a result of this trade on what became known as the Silk Route, Bukhara and Samarkand eventually became extremely wealthy cities, and at times Transoxiana (Mawarannahr) was one of the most influential and powerful Persian provinces of antiquity. Triumphant crowd at Registan, Sher-Dor Madrasah. Painting by Vasily Vereshchagin (1872). Russian troops taking Samarkand in 1868, by Nikolay Karazin. In 327 BC Macedonian ruler Alexander the Great conquered the Persian Empire provinces of Sogdiana and Bactria, which contained the territories of modern Uzbekistan. A conquest was supposedly of little help to Alexander as popular resistance was fierce, causing Alexander's army to be bogged down in the region that became the northern part of the Macedonian Greco-Bactrian Kingdom. The kingdom was replaced with the Yuezhi dominated Kushan Empire in the 1st century BC. For many centuries the region of Uzbekistan was ruled by the Persian empires, including the Parthian and Sassanid Empires, as well as by other empires, for example those formed by the Turko-Persian Hephthalite and Turkic Gokturk peoples. In the 8th century, Transoxiana, the territory between the Amudarya and Syrdarya rivers, was conquered by the Arabs (Ali ibn Sattor) who enriched the region with the Early Renaissance. Many notable scientists lived there and contributed to its development during the Islamic Golden Age. Among the achievements of the scholars during this period were the development of trigonometry into its modern form (simplifying its practical application to calculate the phases of the moon), advances in optics, in astronomy, as well as in poetry, philosophy, art, calligraphy and many others, which set the foundation for the Muslim Renaissance. In the 9th and 10th centuries, Transoxiana was included into the Samanid State. Later, Transoxiana saw the incursion of the Turkic-ruled Karakhanids, as well as the Seljuks (Sultan Sanjar) and Kara-Khitans. The Mongol conquest under Genghis Khan during the 13th century would bring about a change to the region. The Mongol invasion of Central Asia led to the displacement of some of the Iranian-speaking people of the region, their culture and heritage being superseded by that of the Mongolian-Turkic peoples who came thereafter. The invasions of Bukhara, Samarkand, Urgench and others resulted in mass murders and unprecedented destruction, such as portions of Khwarezmia being completely razed. Following the death of Genghis Khan in 1227, his empire was divided among his four sons and his family members. Despite the potential for serious fragmentation, the Mongol law of the Mongol Empire maintained orderly succession for several more generations, and control of most of Transoxiana stayed in the hands of the direct descendants of Chagatai Khan, the second son of Genghis Khan. Orderly succession, prosperity, and internal peace prevailed in the Chaghatai lands, and the Mongol Empire as a whole remained a strong and united kingdom (Ulus Batiy, Sattarkhan). During this period, most of present Uzbekistan was part of the Chagatai Khanate except Khwarezm was part of the Golden Horde. After the decline of the Golden Horde, Khwarezm was briefly ruled by the Sufi Dynasty till Timur's conquest of it in 1388. Sufids rules Khwarezm as vassals of alternatively Timurids, Golden Horde and Uzbek Khanate till Persian occupation in 1510. In the early 14th century, however, as the empire began to break up into its constituent parts, the Chaghatai territory was disrupted as the princes of various tribal groups competed for influence. One tribal chieftain, Timur (Tamerlane), emerged from these struggles in the 1380s as the dominant force in Transoxiana. Although he was not a descendant of Genghis Khan, Timur became the de facto ruler of Transoxiana and proceeded to conquer all of western Central Asia, Iran, the Caucasus, Mesopotamia, Asia Minor, and the southern steppe region north of the Aral Sea. He also invaded Russia before dying during an invasion of China in 1405. Timur was known for his extreme brutality and his conquests were accompanied by genocidal massacres in the cities he occupied. Timur initiated the last flowering of Transoxiana by gathering together numerous artisans and scholars from the vast lands he had conquered into his capital, Samarqand. By supporting such people, he imbued his empire with a rich Perso-Islamic culture. During his reign and the reigns of his immediate descendants, a wide range of religious and palatial construction masterpieces were undertaken in Samarqand and other population centres. Amir Timur initiated an exchange of medical discoveries and patronized physicians, scientists and artists from the neighbouring countries such as India; His grandson Ulugh Beg was one of the world's first great astronomers. It was during the Timurid dynasty that Turkic, in the form of the Chaghatai dialect, became a literary language in its own right in Transoxiana, although the Timurids were Persianate in nature. The greatest Chaghataid writer, Ali-Shir Nava'i, was active in the city of Herat (now in northwestern Afghanistan) in the second half of the 15th century. Statue of Tamerlane, Turkic conqueror. In the background are the ruins of his summer palace in Shahrisabz. The Timurid state quickly split in half after the death of Timur. The chronic internal fighting of the Timurids attracted the attention of the Uzbek nomadic tribes living to the north of the Aral Sea. In 1501 the Uzbek forces began a wholesale invasion of Transoxiana. The slave trade in the Khanate of Bukhara became prominent and was firmly established. Before the arrival of the Russians, present Uzbekistan was divided between Emirate of Bukhara and khanates of Khiva and Kokand. In the 19th century, the Russian Empire began to expand and spread into Central Asia. There were 210,306 Russians living in Uzbekistan in 1912. The "Great Game" period is generally regarded as running from approximately 1813 to the Anglo-Russian Convention of 1907. A second, less intensive phase followed the Bolshevik Revolution of 1917. At the start of the 19th century, there were some 3,200 kilometres (2,000 mi) separating British India and the outlying regions of Tsarist Russia. Much of the land between was unmapped. By the beginning of 1920, Central Asia was firmly in the hands of Russia and, despite some early resistance to the Bolsheviks, Uzbekistan and the rest of the Central Asia became a part of the Soviet Union. On 27 October 1924 the Uzbek Soviet Socialist Republic was created. From 1941 to 1945, during World War II, 1,433,230 people from Uzbekistan fought in the Red Army against Nazi Germany. A number also fought on the German side. As many as 263,005 Uzbek soldiers died in the battlefields of the Eastern Front, and 32,670 went missing in action. On 20 June 1990, Uzbekistan declared its state sovereignty. On 31 August 1991, Uzbekistan declared independence after the failed coup attempt in Moscow. 1 September was proclaimed the National Independence Day. The Soviet Union was dissolved on 26 December of that year. Islam Karimov, ruler of Uzbekistan since independence, died on 2 September 2016. He was replaced by his long-time Prime Minister, Shavkat Mirziyoyev, on 14 December of the same year. The Legislative Chamber of the Supreme Assembly (Lower House). 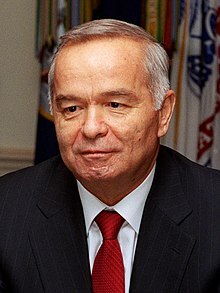 After Uzbekistan declared independence from the Soviet Union in 1991, an election was held, and Islam Karimov was elected as the first President of Uzbekistan. The elections of the Oliy Majlis (Parliament or Supreme Assembly) were held under a resolution adopted by the 16th Supreme Soviet in 1994. In that year, the Supreme Soviet was replaced by the Oliy Majlis. The third elections for the bicameral 150-member Oliy Majlis, the Legislative Chamber, and the 100-member Senate for five-year terms, were held on 27 December 2009. The second elections were held in December 2004 to January 2005. The Oliy Majlis was unicameral up to 2004. Its size increased from 69 deputies (members) in 1994 to 120 in 2004–05, and currently stands at 150. The referendum passed, and Islam Karimov's term was extended by an act of parliament to December 2007. Most international observers refused to participate in the process and did not recognize the results, dismissing them as not meeting basic standards. The 2002 referendum also included a plan for a bicameral parliament consisting of a lower house (the Oliy Majlis) and an upper house (Senate). Members of the lower house are to be "full-time" legislators. Elections for the new bicameral parliament took place on 26 December. The official position is summarised in a memorandum "The measures taken by the government of the Republic of Uzbekistan in the field of providing and encouraging human rights" and amounts to the following: the government does everything that is in its power to protect and to guarantee the human rights of Uzbekistan's citizens. Uzbekistan continuously improves its laws and institutions in order to create a more humane society. Over 300 laws regulating the rights and basic freedoms of the people have been passed by the parliament. For instance, an office of Ombudsman was established in 1996. On 2 August 2005, President Islam Karimov signed a decree that abolished capital punishment in Uzbekistan on 1 January 2008. However, non-governmental human rights organizations, such as IHF, Human Rights Watch, Amnesty International, as well as United States Department of State and Council of the European Union, define Uzbekistan as "an authoritarian state with limited civil rights" and express profound concern about "wide-scale violation of virtually all basic human rights". According to the reports, the most widespread violations are torture, arbitrary arrests, and various restrictions of freedoms: of religion, of speech and press, of free association and assembly. It has also been reported that forced sterilization of rural Uzbek women has been sanctioned by the government. The reports maintain that the violations are most often committed against members of religious organizations, independent journalists, human rights activists and political activists, including members of the banned opposition parties. As of 2015, reports on violations on human rights in Uzbekistan indicated that violations were still going on without any improvement. The Freedom House has consistently ranked Uzbekistan near the bottom of its Freedom in the World ranking since the country's founding in 1991. In the 2018 report, Uzbekistan was one of the 11 worst countries for Political Rights and Civil Liberties. The 2005 civil unrest in Uzbekistan, which resulted in several hundred people being killed, is viewed by many as a landmark event in the history of human rights abuse in Uzbekistan. A concern has been expressed and a request for an independent investigation of the events has been made by the United States, the European Union, the United Nations, the OSCE Chairman-in-Office and the OSCE Office for Democratic Institutions and Human Rights. The government of Uzbekistan is accused of unlawful termination of human life and of denying its citizens freedom of assembly and freedom of expression. The government vehemently rebuffs the accusations, maintaining that it merely conducted an anti-terrorist operation, exercising only necessary force. In addition, some officials claim that "an information war on Uzbekistan has been declared" and the human rights violations in Andijan are invented by the enemies of Uzbekistan as a convenient pretext for intervention in the country's internal affairs. Uzbekistan also maintains the world's second-highest rate of modern slavery, 3.97% of the country's population working as modern slaves. In real terms, this means that there are 1.2 million modern slaves in Uzbekistan. Most work in the cotton industry. The government allegedly forces state employees to pick cotton in the fall months. World Bank loans have been connected to projects that use child labour and forced labour practices in the cotton industry. Islam Karimov died in 2016 and his successor Shavkat Mirziyoyev is considered by most to be pursuing a less autocratic path by increasing cooperation with human rights NGOs, scheduling Soviet-style exit visas to be abolished in 2019, and reducing sentences for certain misdemeanor offenses. However, the Amnesty International report on the country for 2017/8 details many continued repressive measures. Uzbekistan is divided into twelve provinces (viloyatlar, singular viloyat, compound noun viloyati e.g., Toshkent viloyati, Samarqand viloyati, etc. ), one autonomous republic (respublika, compound noun respublikasi e.g. Qoraqalpogʻiston Muxtor Respublikasi, Karakalpakstan Autonomous Republic, etc. ), and one independent city (shahar, compound noun shahri, e.g., Toshkent shahri). Names are given below in Uzbek, Russian, and Karakalpak languages when applicable, although numerous variations of the transliterations of each name exist. 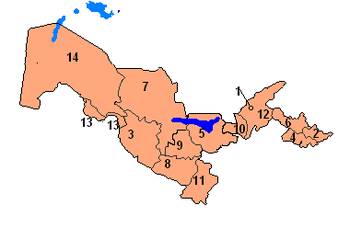 The provinces are further divided into districts (tuman). Along with many Commonwealth of Independent States or CIS economies, Uzbekistan's economy declined during the first years of transition and then recovered after 1995, as the cumulative effect of policy reforms began to be felt. It has shown robust growth, rising by 4% per year between 1998 and 2003 and accelerating thereafter to 7%–8% per year. According to IMF estimates, the GDP in 2008 will be almost double its value in 1995 (in constant prices). Since 2003 annual inflation rates averaged less than 10%. Uzbekistan has GNI per capita (US$1,900 in current dollars in 2013, giving a PPP equivalent of US$3,800). Economic production is concentrated in commodities. In 2011, Uzbekistan was the world's seventh-largest producer and fifth-largest exporter of cotton as well as the seventh-largest world producer of gold. It is also a regionally significant producer of natural gas, coal, copper, oil, silver and uranium. Agriculture employs 27% of Uzbekistan's labour force and contributes 17.4% of its GDP (2012 data). Cultivable land is 4.4 million hectares, or about 10% of Uzbekistan's total area. While official unemployment is very low, underemployment – especially in rural areas – is estimated to be at least 20%. At cotton-harvest time, all students and teachers are still mobilized as unpaid labour to help in the fields. Uzbek cotton is even used to make banknotes in South Korea. The use of child labour in Uzbekistan has led several companies, including Tesco, C&A, Marks & Spencer, Gap, and H&M, to boycott Uzbek cotton. Facing a multitude of economic challenges upon acquiring independence, the government adopted an evolutionary reform strategy, with an emphasis on state control, reduction of imports and self-sufficiency in energy. Since 1994, the state-controlled media have repeatedly proclaimed the success of this "Uzbekistan Economic Model" and suggested that it is a unique example of a smooth transition to the market economy while avoiding shock, pauperism and stagnation. The gradualist reform strategy has involved postponing significant macroeconomic and structural reforms. The state in the hands of the bureaucracy has remained a dominant influence in the economy. Corruption permeates the society and grows more rampant over time: Uzbekistan's 2005 Corruption Perception Index was 137 out of 159 countries, whereas in 2007 Uzbekistan was 175th out of 179 countries. A February 2006 report on the country by the International Crisis Group suggests that revenues earned from key exports, especially cotton, gold, corn and increasingly gas, are distributed among a very small circle of the ruling elite, with little or no benefit for the populace at large. The recent high-profile corruption scandals involving government contracts and large international companies, notably TeliaSoneria, have shown that businesses are particularly vulnerable to corruption when operating in Uzbekistan. According to the Economist Intelligence Unit, "the government is hostile to allowing the development of an independent private sector, over which it would have no control". The economic policies have repelled foreign investment, which is the lowest per capita in the CIS. For years, the largest barrier to foreign companies entering the Uzbekistan market has been the difficulty of converting currency. In 2003 the government accepted the obligations of Article VIII under the International Monetary Fund (IMF) providing for full currency convertibility. However, strict currency controls and the tightening of borders have lessened the effect of this measure. Uzbekistan experienced rampant inflation of around 1000% per year immediately after independence (1992–1994). Stabilisation efforts implemented with guidance from the IMF paid off. The inflation rates were brought down to 50% in 1997 and then to 22% in 2002. Since 2003 annual inflation rates averaged less than 10%. Tight economic policies in 2004 resulted in a drastic reduction of inflation to 3.8% (although alternative estimates based on the price of a true market basket put it at 15%). The inflation rates moved up to 6.9% in 2006 and 7.6% in 2007 but have remained in the single-digit range. The government of Uzbekistan restricts foreign imports in many ways, including high import duties. Excise taxes are applied in a highly discriminatory manner to protect locally produced goods. Official tariffs are combined with unofficial, discriminatory charges resulting in total charges amounting to as much as 100 to 150% of the actual value of the product, making imported products virtually unaffordable. Import substitution is an officially declared policy and the government proudly reports a reduction by a factor of two in the volume of consumer goods imported. A number of CIS countries are officially exempt from Uzbekistan import duties. Uzbekistan has a Bilateral Investment Treaty with fifty other countries. The Republican Stock Exchange (RSE) opened in 1994. The stocks of all Uzbek joint stock companies (around 1250) are traded on RSE. The number of listed companies as of January 2013 exceeds 110. Securities market volume reached 2 trillion in 2012, and the number is rapidly growing due to the rising interest by companies of attracting necessary resources through the capital market. According to Central Depository as of January 2013 par value of outstanding shares of Uzbek emitters exceeded 9 trillion. Thanks in part to the recovery of world market prices of gold and cotton (the country's key export commodities), expanded natural gas and some manufacturing exports, and increasing labour migrant transfers, the current account turned into a large surplus (between 9% and 11% of GDP from 2003 to 2005) and foreign exchange reserves, including gold, more than doubled to around US$3 billion. Foreign exchange reserves amounted in 2010 to 13 billion US$. Uzbekistan is predicted to be one of the fastest-growing economies in the world (top 26) in future decades, according to a survey by global bank HSBC. Newlywed couples visit Tamerlane's statues to receive wedding blessings. The model, singer and actress Djamilya Abdullaeva. Uzbekistan is Central Asia's most populous country. Its 32,121,000 citizens comprise nearly half the region's total population. The population of Uzbekistan is very young: 34.1% of its people are younger than 14 (2008 estimate). According to official sources, Uzbeks comprise a majority (80%) of the total population. Other ethnic groups include Russians 2%, Tajiks 5%, Kazakhs 3%, Karakalpaks 2.5% and Tatars 1.5% (1996 estimates). There is some controversy about the percentage of the Tajik population. While official state numbers from Uzbekistan put the number at 5%, the number is said to be an understatement and some Western scholars put the number up to 20%–30%. The Uzbeks intermixed with Sarts, a Turko-Persian population of Central Asia. Today, the majority of Uzbeks are admixed and represent varying degrees of diversity. Uzbekistan has an ethnic Korean population that was forcibly relocated to the region by Stalin from the Soviet Far East in 1937–1938. There are also small groups of Armenians in Uzbekistan, mostly in Tashkent and Samarkand. The nation is 88% Muslim (mostly Sunni, with a 5% Shi'a minority), 9% Eastern Orthodox and 3% other faiths. The U.S. State Department's International Religious Freedom Report 2004 reports that 0.2% of the population are Buddhist (these being ethnic Koreans). 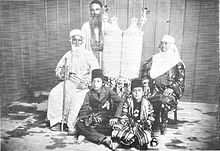 The Bukharan Jews have lived in Central Asia, mostly in Uzbekistan, for thousands of years. There were 94,900 Jews in Uzbekistan in 1989 (about 0.5% of the population according to the 1989 census), but now, since the dissolution of the Soviet Union, most Central Asian Jews left the region for the United States, Germany, or Israel. Fewer than 5,000 Jews remained in Uzbekistan in 2007. Russians in Uzbekistan represented 5.5% of the total population in 1989. During the Soviet period, Russians and Ukrainians constituted more than half the population of Tashkent. The country counted nearly 1.5 million Russians, 12.5% of the population, in the 1970 census. After the dissolution of the Soviet Union, significant emigration of ethnic Russians has taken place, mostly for economic reasons. In the 1940s, the Crimean Tatars, along with the Volga Germans, Chechens, Pontic Greeks, Kumaks and many other nationalities were deported to Central Asia. Approximately 100,000 Crimean Tatars continue to live in Uzbekistan. The number of Greeks in Tashkent has decreased from 35,000 in 1974 to about 12,000 in 2004. The majority of Meskhetian Turks left the country after the pogroms in the Fergana valley in June 1989. At least 10% of Uzbekistan's labour force works abroad (mostly in Russia and Kazakhstan) and other countries. Uzbekistan has a 99.3% literacy rate among adults older than 15 (2003 estimate), which is attributable to the free and universal education system of the Soviet Union. Life expectancy in Uzbekistan is 66 years among men and 72 years among women. Islam is the dominant religion in Uzbekistan, although Soviet power (1924–1991) discouraged the expression of religious belief. A 2009 Pew Research Center report stated that Uzbekistan's population is 93.3% Muslim. Russian Orthodox Christians comprised 7% of the population in 2014. An estimated 93,000 Jews lived in the country in the early 1990s. Despite the predominance of Islam, the practice of the faith is far from monolithic. Uzbekistanis have practised many versions of Islam. The conflict of Islamic tradition with various agendas of reform or secularization throughout the 20th century has left a wide variety of Islamic practices in Central Asia. 90% are Sunni Muslim and rest secular or non-believers; 1% are Shias. The end of Soviet control in Uzbekistan in 1991 did not bring an immediate upsurge of religion-associated fundamentalism, as many had predicted, but rather a gradual re-acquaintance with the precepts of the Islamic faith. However, since 2015 there has been a slight increase in Islamist activity, with organizations such as the Islamic Movement of Uzbekistan declaring allegiance to ISIL and contributing fighters for terror-attacks abroad, although the terror threat in Uzbekistan itself remains low. 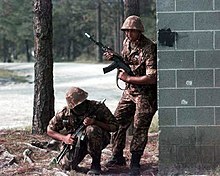 (See Terrorism in Uzbekistan). The Jewish community in the Uzbek lands flourished for centuries, with occasional hardships during the reigns of certain rulers. During the rule of Tamerlane in the 14th century Jews contributed greatly to his efforts to rebuild Samarkand and a great Jewish centre was established there. After the area came under Russian rule in 1868, Jews were granted equal rights with the local Muslim population. 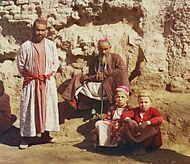 In that period some 50,000 Jews lived in Samarkand and 20,000 in Bukhara. After the Russian revolutions in 1917 and the establishment of the Soviet regime, Jewish religious life became restricted. By 1935 only one synagogue out of 30 remained in Samarkand; nevertheless, underground Jewish community life continued during the Soviet era. During World War II[when?] one million Jews from the European parts of the Soviet Union arrived in Uzbekistan as refugees or were exiled by Stalin. By 1970 there were 103,000 Jews registered in the Uzbek SSR. In the late 1980s nationalistic riots increased as the Soviet Union started to dissolve, damaging, among other areas, the Jewish quarter in Andijan. Most of the Jews of Uzbekistan emigrated to Israel or to the United States of America. A small community of several thousand remained in the country as of 2013[update]: some 7,000 lived in Tashkent, 3,000 in Bukhara and 700 in Samarkand. The Uzbek language is one of the Turkic languages close to Uyghur language and both of them belong to the Karluk languages branch of the Turkic language family. Uzbek language is the only de jure official national language, and since 1992 is officially written in the Latin alphabet. Although the Russian language is not formally clarified to be an official language in the country, it is widely used in all fields, including official documents. Digital information from all forms of the government is bilingual. Thus, the Russian language is the de facto second official language in Uzbekistan. Russian is an important language for interethnic communication, especially in the cities, including much day-to-day social, technical, scientific, governmental and business use. The country is also home to approximately one million people whose native language is Russian. The Tajik language (a variety of Persian) is widespread in the cities of Bukhara and Samarkand because of their relatively large population of ethnic Tajiks (official 1,5 million, non-official scholarly estimates are 8–11 million). It is also found in large pockets in Kasansay, Chust, Rishtan and Sokh in Ferghana Valley, as well as in Burchmulla, Ahangaran, Baghistan in the middle Syr Darya district, and finally in, Shahrisabz, Qarshi, Kitab and the river valleys of Kafiringan and Chaganian, forming altogether, approximately 10–15% of the population of Uzbekistan. Karakalpak, also a Turkic language but closer to Kazakh, is spoken in the Republic of Karakalpakstan and has an official status there. This language is spoken by half a million people. More than 800,000 people also speak the Kazakh language. 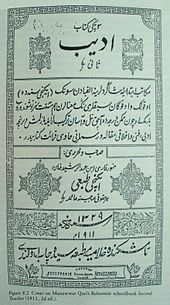 Before the 1920s, the written language of Uzbeks was called Turki (known to Western scholars as Chagatai) and used the Nastaʿlīq script. In 1926 the Latin alphabet was introduced and went through several revisions throughout the 1930s. Finally, in 1940, the Cyrillic alphabet was introduced by Soviet authorities and was used until the fall of Soviet Union. In 1993 Uzbekistan shifted back to the Latin script (Uzbek alphabet), which was modified in 1996 and is being taught in schools since 2000. In schools, colleges and universities teach only in Latin script. At the same time, in the country for Uzbek language is also used officially abolished the Cyrillic alphabet. Cyrillic is used in a number of popular newspapers and websites. Some of the text on the TV on some channels is duplicated on the Cyrillic alphabet. Cyrillic is popular with the older generation of Uzbeks who grew up on this alphabet. There are no language requirements for the citizenship of Uzbekistan. According to the official source report, as of 10 March 2008, the number of cellular phone users in Uzbekistan reached 7 million, up from 3.7 million on 1 July 2007. The largest mobile operator in terms of number of subscribers is MTS-Uzbekistan (former Uzdunrobita and part of Russian Mobile TeleSystems) and it is followed by Beeline (part of Russia's Beeline) and UCell (ex Coscom) (originally part of the U.S. MCT Corp., now a subsidiary of the Nordic/Baltic telecommunication company TeliaSonera AB). As of 1 July 2007, the estimated number of internet users was 1.8 million, according to UzACI. Internet Censorship exists in Uzbekistan and in October 2012 the government toughened internet censorship by blocking access to proxy servers. Reporters Without Borders has named Uzbekistan's government an "Enemy of the Internet" and government control over the internet has increased dramatically since the start of the Arab Spring. The press in Uzbekistan practices self-censorship and foreign journalists have been gradually expelled from the country since the Andijan massacre of 2005 when government troops fired into crowds of protesters killing 187 according to official reports and estimates of several hundred by unofficial and witness accounts. Tashkent, the nation's capital and largest city, has a three-line rapid transit system built in 1977, and expanded in 2001 after ten years' independence from the Soviet Union. Uzbekistan and Kazakhstan are currently the only two countries in Central Asia with a subway system. It is promoted as one of the cleanest systems in the former Soviet Union. The stations are exceedingly ornate. For example, the station Metro Kosmonavtov built in 1984 is decorated using a space travel theme to recognise the achievements of mankind in space exploration and to commemorate the role of Vladimir Dzhanibekov, the Soviet cosmonaut of Uzbek origin. A statue of Vladimir Dzhanibekov stands near a station entrance. There are government-operated trams and buses running across the city. There are also many taxis, registered and unregistered. Uzbekistan has plants that produce modern cars. The car production is supported by the government and the Korean auto company Daewoo. In May 2007 UzDaewooAuto, the car maker, signed a strategic agreement with General Motors-Daewoo Auto and Technology (GMDAT, see GM Uzbekistan also). The government bought a stake in Turkey's Koc in SamKochAvto, a producer of small buses and lorries. Afterward, it signed an agreement with Isuzu Motors of Japan to produce Isuzu buses and lorries. Train links connect many towns in Uzbekistan, as well as neighboring former republics of the Soviet Union. Moreover, after independence two fast-running train systems were established. 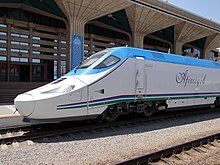 Uzbekistan has launched the first high-speed railway in Central Asia in September 2011 between Tashkent and Samarqand. The new high-speed electric train Talgo 250, called Afrosiyob, was manufactured by Patentes Talgo S.L. (Spain) and took its first trip from Tashkent to Samarkand on 26 August 2011. There is a large airplane plant that was built during the Soviet era – Tashkent Chkalov Aviation Manufacturing Plant or ТАПОиЧ in Russian. The plant originated during World War II, when production facilities were evacuated south and east to avoid capture by advancing Nazi forces. Until the late 1980s, the plant was one of the leading aeroplane production centres in the USSR. With dissolution of the Soviet Union its manufacturing equipment became outdated; most of the workers were laid off. Now it produces only a few planes a year, but with interest from Russian companies growing, there are rumours of production-enhancement plans. With close to 65,000 servicemen, Uzbekistan possesses the largest armed forces in Central Asia. The military structure is largely inherited from the Turkestan Military District of the Soviet Army, although it is going through a reform to be based mainly on motorized infantry with some light and special forces. The Uzbek Armed Forces' equipment is standard, mostly consisting those of Post-Soviet inheritance and newly crafted Russian and some American equipment. The government has accepted the arms control obligations of the former Soviet Union, acceded to the Nuclear Non-Proliferation Treaty (as a non-nuclear state), and supported an active program by the U.S. Defense Threat Reduction Agency (DTRA) in western Uzbekistan (Nukus and Vozrozhdeniye Island). The Government of Uzbekistan spends about 3.7% of GDP on the military but has received a growing infusion of Foreign Military Financing (FMF) and other security assistance funds since 1998. Following 11 September 2001 terrorist attacks in the U.S., Uzbekistan approved the U.S. Central Command's request for access to an air base, the Karshi-Khanabad airfield, in southern Uzbekistan. However, Uzbekistan demanded that the U.S. withdraw from the airbases after the Andijan massacre and the U.S. reaction to this massacre. The last US troops left Uzbekistan in November 2005. On 23 June 2006, Uzbekistan became a full participant in the Collective Security Treaty Organization (CSTO), but informed the CSTO to suspend its membership in June 2012. Uzbekistan joined the Commonwealth of Independent States in December 1991. However, it is opposed to reintegration and withdrew from the CIS collective security arrangement in 1999. Since that time, Uzbekistan has participated in the CIS peacekeeping force in Tajikistan and in UN-organized groups to help resolve the Tajikistan and Afghanistan conflicts, both of which it sees as posing threats to its own stability. Previously close to Washington (which gave Uzbekistan half a billion dollars in aid in 2004, about a quarter of its military budget), the government of Uzbekistan has recently restricted American military use of the airbase at Karshi-Khanabad for air operations in neighbouring Afghanistan. Uzbekistan was an active supporter of U.S. efforts against worldwide terrorism and joined the coalitions that have dealt with both Afghanistan and Iraq. The relationship between Uzbekistan and the United States began to deteriorate after the so-called "colour revolutions" in Georgia and Ukraine (and to a lesser extent Kyrgyzstan). When the U.S. joined in a call for an independent international investigation of the bloody events at Andijan, the relationship further declined, and President Islam Karimov changed the political alignment of the country to bring it closer to Russia and China. 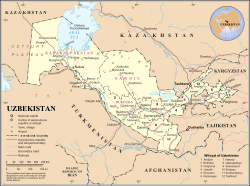 In late July 2005, the government of Uzbekistan ordered the United States to vacate an air base in Karshi-Kanabad (near Uzbekistan's border with Afghanistan) within 180 days. Karimov had offered use of the base to the U.S. shortly after 9/11. It is also believed by some Uzbeks that the protests in Andijan were brought about by the U.K. and U.S. influences in the area of Andijan. This is another reason for the hostility between Uzbekistan and the West. Uzbekistan is a member of the United Nations (UN) (since 2 March 1992), the Euro-Atlantic Partnership Council (EAPC), Partnership for Peace (PfP), and the Organization for Security and Co-operation in Europe (OSCE). It belongs to the Organisation of Islamic Cooperation (OIC) and the Economic Cooperation Organization (ECO) (comprising the five Central Asian countries, Azerbaijan, Iran, Turkey, Afghanistan, and Pakistan). In 1999, Uzbekistan joined the GUAM alliance (Georgia, Ukraine, Azerbaijan and Moldova), which was formed in 1997 (making it GUUAM), but pulled out of the organization in 2005. Uzbekistan is also a member of the Shanghai Cooperation Organisation (SCO) and hosts the SCO's Regional Anti-Terrorist Structure (RATS) in Tashkent. Uzbekistan joined the new Central Asian Cooperation Organisation (CACO) in 2002. The CACO consists of Uzbekistan, Tajikistan, Kazakhstan and Kyrgyzstan. It is a founding member of, and remains involved in, the Central Asian Union, formed with Kazakhstan and Kyrgyzstan, and joined in March 1998 by Tajikistan. In September 2006, UNESCO presented Islam Karimov an award for Uzbekistan's preservation of its rich culture and traditions. Despite criticism, this seems to be a sign of improving relationships between Uzbekistan and the West. The month of October 2006 also saw a decrease in the isolation of Uzbekistan from the West. The EU announced that it was planning to send a delegation to Uzbekistan to talk about human rights and liberties, after a long period of hostile relations between the two. Although it is equivocal about whether the official or unofficial version of the Andijan Massacre is true, the EU is evidently willing to ease its economic sanctions against Uzbekistan. Nevertheless, it is generally assumed among Uzbekistan's population that the government will stand firm in maintaining its close ties with the Russian Federation and in its theory that the 2004–2005 protests in Uzbekistan were promoted by the US and UK. In January 2008, Lola Karimova-Tillyaeva was appointed to her current role as Uzbekistan's ambassador to UNESCO. Karimova-Tillyaeva and her team have been instrumental in promoting inter-cultural dialogue by increasing European society's awareness of Uzbekistan's cultural and historical heritage. Uzbekistan has a wide mix of ethnic groups and cultures, with the Uzbek being the majority group. In 1995 about 71% of Uzbekistan's population was Uzbek. The chief minority groups were Russians (8%), Tajiks (5–30%), Kazakhs (4%), Tatars (2.5%) and Karakalpaks (2%). It is said, however, that the number of non-Uzbek people living in Uzbekistan is decreasing as Russians and other minority groups slowly leave and Uzbeks return from other parts of the former Soviet Union. When Uzbekistan gained independence in 1991, there was concern that Muslim fundamentalism would spread across the region. The expectation was that a country long denied freedom of religious practice would undergo a very rapid increase in the expression of its dominant faith. As of 1994, over half of Uzbekistan's population was said to be Muslim, though in an official survey few of that number had any real knowledge of the religion or knew how to practice it. However, Islamic observance is increasing in the region. Central Asian classical music is called Shashmaqam, which arose in Bukhara in the late 16th century when that city was a regional capital. Shashmaqam is closely related to Azerbaijani Mugam and Uyghur muqam. The name, which translates as six maqams refers to the structure of the music, which contains six sections in six different Musical modes, similar to classical Persian traditional music. Interludes of spoken Sufi poetry interrupt the music, typically beginning at a lower register and gradually ascending to a climax before calming back down to the beginning tone. Uzbekistan has a high literacy rate, with about 99.3% of adults above the age of 15 being able to read and write. However, with only 76% of the under-15 population currently enrolled in education (and only 20% of the 3–6 year olds attending pre-school), this figure may drop in the future. Students attend school Monday through Saturday during the school year, and education officially concludes at the end of the 12th grade. There are two international schools operating in Uzbekistan, both in Tashkent: The British School catering for elementary students only, and Tashkent International School, a K-12 international curriculum school. Uzbekistan has encountered severe budget shortfalls in its education program. The education law of 1992 began the process of theoretical reform, but the physical base has deteriorated and curriculum revision has been slow. A large contributor to this decline is the low level of wages received by teachers and the lack of spending on infrastructure, buildings and resources on behalf of the government. Corruption within the education system is also rampant, with students from wealthier families routinely bribing teachers and school executives to achieve high grades without attending school, or undertaking official examinations. Uzbekistan's universities create almost 600,000 graduates annually, though the general standard of university graduates, and the overall level of education within the tertiary system, is low. Several universities, including Westminster University, Turin University, Management University Institute of Singapore, Bucheon University in Tashkent|Bucheon University]] and Inha University Tashkent maintain a campus in Tashkent offering English language courses across several disciplines. The Russian-language high education is provided by most national universities, including foreign Moscow State University and Gubkin Russian State University of Oil and Gas, maintaining campuses in Tashkent. 1 January: New Year, "Yangi Yil Bayrami"
14 January: Day of Defenders of the Motherland, "Vatan Himoyachilari kuni"
8 March: International Women's Day, "Xalqaro Xotin-Qizlar kuni"
21 March: Nowruz, "Navroʻz Bayrami"
9 May: Remembrance Day, "Xotira va Qadirlash kuni"
1 September: Independence Day, "Mustaqillik kuni"
1 October: Teacher's Day, "Oʻqituvchi va Murabbiylar"
8 December: Constitution Day, "Konstitutsiya kuni"
Uzbek cuisine is influenced by local agriculture, as in most nations. There is a great deal of grain farming in Uzbekistan, so breads and noodles are of importance and Uzbek cuisine has been characterized as "noodle-rich". Mutton is a popular variety of meat due to the abundance of sheep in the country and it is part of various Uzbek dishes. Uzbekistan's signature dish is palov (plov or osh), a main course typically made with rice, pieces of meat, and grated carrots and onions. 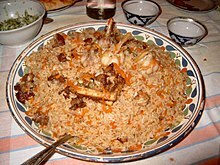 Oshi nahor, or morning plov, is served in the early morning (between 6 am and 9 am) to large gatherings of guests, typically as part of an ongoing wedding celebration. Other notable national dishes include shurpa (shurva or shorva), a soup made of large pieces of fatty meat (usually mutton), and fresh vegetables; norin and laghman, noodle-based dishes that may be served as a soup or a main course; manti, chuchvara, and somsa, stuffed pockets of dough served as an appetizer or a main course; dimlama, a meat and vegetable stew; and various kebabs, usually served as a main course. Green tea is the national hot beverage taken throughout the day; teahouses (chaikhanas) are of cultural importance. Black tea is preferred in Tashkent, but both green and black teas are taken daily, without milk or sugar. Tea always accompanies a meal, but it is also a drink of hospitality that is automatically offered: green or black to every guest. Ayran, a chilled yogurt drink, is popular in summer, but does not replace hot tea. The use of alcohol is less widespread than in the West, but wine is comparatively popular for a Muslim nation as Uzbekistan is largely secular. Uzbekistan has 14 wineries, the oldest and most famous being the Khovrenko Winery in Samarkand (established in 1927). The Samarkand Winery produces a range of dessert wines from local grape varieties: Gulyakandoz, Shirin, Aleatiko, and Kabernet likernoe (literally Cabernet dessert wine in Russian). Uzbek wines have received international awards and are exported to Russia and other countries. Uzbekistan is home to former racing cyclist Djamolidine Abdoujaparov. Abdoujaparov has won the green jersey points contest in the Tour de France three times. Abdoujaparov was a specialist at winning stages in tours or one-day races when the bunch or peloton would finish together. He would often 'sprint' in the final kilometre and had a reputation as being dangerous in these bunch sprints as he would weave from side to side. This reputation earned him the nickname 'The Terror of Tashkent'. Artur Taymazov won Uzbekistan's first wrestling medal at the 2000 Summer Olympic Games, as well as three gold medals at the 2004, 2008 Summer Olympic Games and 2012 Summer Olympic Games in Men's 120 kg. Ruslan Chagaev is a former professional boxer representing Uzbekistan in the WBA. He won the WBA champion title in 2007 after defeating Nikolai Valuev. Chagaev defended his title twice before losing it to Vladimir Klitschko in 2009. Another young talented boxer Hasanboy Dusmatov, light flyweight champion at the 2016 Summer Olympics, won the Val Barker Trophy for the outstanding male boxer of Rio 2016 on 21 August 2016. On 21 December 2016 Dusmatov was honoured with the AIBA Boxer of the Year award at a 70-year anniversary event of AIBA. Michael Kolganov, a sprint canoer, was world champion and won an Olympic bronze in the K-1 500-meter. Gymnast Alexander Shatilov won a world bronze as an artistic gymnast in floor exercise, and gymnast Oksana Chusovitina has amassed over 70 medals for the country. Uzbekistan is the home of the International Kurash Association. Kurash is an internationalized and modernized form of traditional Uzbek wrestling. Football is the most popular sport in Uzbekistan. Uzbekistan's premier football league is the Uzbek League, which has consisted of 16 teams since 2015. The current champions (2016) are Lokomotiv Tashkent. Pakhtakor holds the record for the most Uzbekistan champion titles, having won the league 10 times. The current Player of the Year (2015) is Odil Akhmedov. Uzbekistan's football clubs regularly participate in the AFC Champions League and the AFC Cup. Nasaf won AFC Cup in 2011, the first international club cup for Uzbek football. Before Uzbekistan's independence in 1991, the country used to be part of the Soviet Union football, rugby union, basketball, ice hockey, and handball national teams. After independence, Uzbekistan created its own football, rugby union, basketball and futsal national teams. Tennis is also a very popular sport in Uzbekistan, especially after Uzbekistan's independence in 1991. Uzbekistan has its own Tennis Federation called the "UTF" (Uzbekistan Tennis Federation), created in 2002. Uzbekistan also hosts an International WTA tennis tournament, the "Tashkent Open", held in Uzbekistan's capital city. This tournament has been held since 1999, and is played on outdoor hard courts. The most notable active players from Uzbekistan are Denis Istomin and Akgul Amanmuradova. Chess is quite popular in Uzbekistan. Uzbekistan-born Rustam Kasimdzhanov was the FIDE World Chess Champion in 2004. Other popular sports in Uzbekistan include basketball, judo, team handball, baseball, taekwondo, and futsal. ^ "Constitution of the Republic of Uzbekistan". ksu.uz. Archived from the original on 27 June 2016. Retrieved 1 January 2015. ^ O‘zbekiston aholisi soni 32,1 mln. kishidan iborat. Uzreport.news. Retrieved 7 August 2017. ^ ""Freedom in the World 2018 - Uzbekistan"". freedomhouse.org. Freedomhouse. Retrieved 7 October 2018. ^ "Демографическая ситуация" (PDF). Statistika qo'mitasi. Retrieved 20 January 2019. ^ "Income Gini coefficient | Human Development Reports". hdr.undp.org. Archived from the original on 23 July 2010. Retrieved 6 December 2017. ^ "GINI index – Uzbekistan". MECOMeter – Macro Economy Meter. Archived from the original on 4 April 2015. Retrieved 6 December 2017. ^ "2016 Human Development Report" (PDF). United Nations Development Programme. 2015. Archived (PDF) from the original on 22 March 2017. Retrieved 15 December 2015. ^ "Chapter 1: Religious Affiliation". The World’s Muslims: Unity and Diversity. Pew Research Center's Religion & Public Life Project. 9 August 2012. Retrieved 4 September 2013. ^ "Constitution of the Republic of Uzbekistan". ksu.uz. Archived from the original on 27 June 2016. Retrieved 24 December 2014. ^ "Uzbekistan ends systematic use of child labour and takes measures to end forced labour – Modern Diplomacy". moderndiplomacy.eu. Archived from the original on 22 December 2017. Retrieved 19 December 2017. ^ "Eurasia's Latest Economic Reboot Can Be Found In Uzbekistan". Forbes. 14 September 2017. Archived from the original on 14 September 2017. Retrieved 18 September 2017. ^ Lillis, Joanna (3 October 2017). "Are decades of political repression making way for an 'Uzbek spring'?". The Guardian. ISSN 0261-3077. Archived from the original on 1 December 2017. Retrieved 19 November 2017. ^ "Uzbekistan: A Quiet Revolution Taking Place – Analysis". Eurasia Review. 8 December 2017. Archived from the original on 8 December 2017. Retrieved 8 December 2017. ^ "The growing ties between Afghanistan and Uzbekistan – CSRS En". CSRS En. 28 January 2017. Archived from the original on 22 December 2017. Retrieved 25 December 2017. ^ a b "Uzbekistan 2017/2018". Amnesty International. ^ "Uzbekistan | Energy 2018 – Global Legal Insights". GLI – Global Legal InsightsUzbekistan | Energy 2018. Archived from the original on 3 December 2017. Retrieved 2 December 2017. ^ "Countries of the world". worldatlas.com. Archived from the original on 7 May 2010. Retrieved 2 May 2010. ^ a b c Uzbekistan will publish its own book of records – Ferghana.ru Archived 13 May 2013 at the Wayback Machine. 18 July 2007. Retrieved 29 July 2009. ^ a b Climate Archived 22 September 2008 at the Wayback Machine, Uzbekistan : Country Studies – Federal Research Division, Library of Congress. ^ "Environment Archived 8 December 2013 at the Wayback Machine". In Glenn E. Curtis (Ed. ), Uzbekistan: A Country Study Archived 23 September 2006 at the Wayback Machine. Washington: Government Printing Office for the Library of Congress, 1996. Online version retrieved 2 May 2010. ^ "Uzbekistan: Environmental disaster on a colossal scale". Médecins Sans Frontières. 1 November 2000. Archived from the original on 30 September 2007. Retrieved 2 May 2010. ^ Climate Risk Knowledge Management Platform for Central Asia, UNDP Archived 26 September 2015 at the Wayback Machine. Ca-crm.info. Retrieved on 29 November 2015. ^ a b c d This section incorporates text from the following source, which is in the public domain: Lubin, Nancy (1997). "Uzbekistan", chapter 5 in: Glenn E. Curtis (Ed. ), Kazakstan, Kyrgyzstan, Tajikistan, Turkmenistan, and Uzbekistan: Country Studies. Washington, DC: Federal Research Division, Library of Congress. ISBN 0844409383. pp. 375–468: Early History, pp. 385–386. ^ Davidovich, E. A. (1998). "The Karakhanids; Chapter 6 The Karakhanids". In C.E. Bosworth (ed.). History of Civilisations of Central Asia. 4 part I. UNESCO Publishing. pp. 119–144. ISBN 92-3-103467-7. ^ a b c d This section incorporates text from the following source, which is in the public domain: Lubin, Nancy (1997). "Uzbekistan", chapter 5 in: Glenn E. Curtis (Ed. ), Kazakstan, Kyrgyzstan, Tajikistan, Turkmenistan, and Uzbekistan: Country Studies Archived 30 December 2016 at the Wayback Machine. Washington, DC: Federal Research Division, Library of Congress. ISBN 0844409383. p. 375–468; here: "The Rule of Timur ", p. 389–390. ^ History of Civilizations of Central Asia (Vol. 4, Part 1). Motilal Banarsidass. 1992. p. 328. ISBN 978-81-208-1595-7. Archived from the original on 29 March 2018. ^ Forbes, Andrew, & Henley, David: Timur's Legacy: The Architecture of Bukhara and Samarkand Archived 24 May 2013 at the Wayback Machine (CPA Media). ^ Medical Links between India & Uzbekistan in Medieval Times by Hakim Syed Zillur Rahman, Historical and Cultural Links between India & Uzbekistan, Khuda Bakhsh Oriental Library, Patna, 1996. pp. 353–381. ^ "Adventure in the East". Time. 6 April 1959. Archived from the original on 1 February 2011. Retrieved 28 January 2011. ^ Shlapentokh, Vladimir; Sendich, Munir; Payin, Emil (1994) The New Russian Diaspora: Russian Minorities in the Former Soviet Republics Archived 8 April 2015 at the Wayback Machine. M.E. Sharpe. p. 108. ISBN 1-56324-335-0. ^ "Obituary: Uzbekistan President Islam Karimov". BBC News. 2 October 2016. Archived from the original on 3 September 2016. ^ OMCT and Legal Aid Society, Denial of justice in Uzbekistan – an assessment of the human rights situation and national system of protection of fundamental rights Archived 5 December 2010 at the Wayback Machine, April 2005. ^ Antelava, Natalia (21 December 2012). "Tweets from Gulnara the dictator's daughter". New Yorker. Archived from the original on 4 January 2013. ^ World Report 2015: Uzbekistan | Human Rights Watch Archived 23 March 2016 at the Wayback Machine. Hrw.org. Retrieved on 20 March 2016. ^ McMahon, Robert (7 June 2005). "Uzbekistan: Report Cites Evidence Of Government 'Massacre' In Andijon – Radio Free Europe/Radio Liberty/Radio Liberty/Radio Liberty". Radio Free Europe/Radio Liberty. Archived from the original on 3 September 2010. Retrieved 2 May 2010. ^ "Uzbekistan: Independent international investigation needed into Andizhan events". Amnesty International. 23 June 2005. Archived from the original on 12 October 2007. Retrieved 2 May 2010. ^ "Press-service of the President of the Republic of Uzbekistan:". Press-service.uz. 17 May 2005. Archived from the original on 8 March 2008. Retrieved 2 May 2010. ^ Акмаль Саидов (27 October 2005). "Андижанские события стали поводом для беспрецедентного давления на Узбекистан". Kreml.Org. Archived from the original on 5 August 2014. Retrieved 2 May 2010. ^ a b Findings – Walk Free Foundation – Global Slavery Index 2014 Archived 26 December 2014 at the Wayback Machine. Globalslaveryindex.org. Retrieved on 29 November 2015. ^ "Forced Cotton-Picking Earns Uzbekistan Shameful Spot In 'Slavery Index'". rferl.org. Archived from the original on 16 January 2017. Retrieved 14 January 2017. ^ "Uzbekistan: Forced Labor Linked to World Bank". Human Rights Watch. Archived from the original on 18 July 2017. ^ "Human Rights Watch Delegation To Visit Uzbekistan". RadioFreeEurope/RadioLiberty. Archived from the original on 22 February 2018. Retrieved 22 February 2018. ^ akbaryusupov. "Shavkat Mirziyoyev meets UN High Commissioner for Human Rights". Archived from the original on 22 February 2018. Retrieved 22 February 2018. ^ "Uzbekistan To Abolish Exit Visa System In 2019". RadioFreeEurope/RadioLiberty. Archived from the original on 22 February 2018. Retrieved 22 February 2018. ^ "Uzbekistan Flirts With Disaster – Geopolitical Futures". 11 July 2017. Archived from the original on 11 July 2017. ^ "Statistical Review of Uzbekistan 2008" (PDF). p. 176. Archived from the original (PDF) on 13 November 2010. Retrieved 2 May 2010. ^ Supply of Uranium Archived 9 May 2008 at the Wayback Machine. World Nuclear Association. August 2012. ^ "New head of NHC Uzbekneftegaz appointed". Gazprom International. Gazprom. Retrieved 21 April 2019. ^ "REPUBLIC OF UZBEKISTAN". International Monetary Fund. IMF. Retrieved 22 April 2019. ^ "The National Cotton Council of America: Rankings". 2011. Archived from the original on 15 April 2012. Retrieved 26 April 2012. 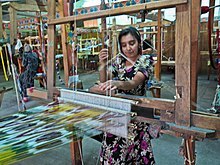 ^ "Country Profile: Uzbekistan". IRIN. Archived from the original on 27 August 2010. Retrieved 2 May 2010. ^ a b c d "Demographic situation in the Republic of Uzbekistan". The State Committee of the Republic of Uzbekistan on statistics. Retrieved 28 January 2011. ^ "Programmes | Child labour and the High Street". BBC News. 30 October 2007. Archived from the original on 23 March 2010. Retrieved 2 May 2010. ^ "Uzbekistan: Korean government uses Uzbek cotton to make banknotes". BS-AGRO. 12 December 2013. Archived from the original on 20 December 2013. ^ "Tesco Ethical Assessment Programme" (PDF). Archived from the original (PDF) on 6 July 2010. Retrieved 2 May 2010. ^ "C&A Code of Conduct for Uzbekistan". C&A. Archived from the original on 27 May 2010. Retrieved 2 May 2010. ^ Saidazimova, Gulnoza (12 June 2008). "Central Asia: Child Labor Alive And Thriving". Radio Free Europe/Radio Liberty. Archived from the original on 27 July 2011. Retrieved 8 July 2008. ^ Islam Karimov's interview to Rossijskaya Gazeta, 7 July 1995 "Archived copy". Archived from the original on 22 September 2008. Retrieved 22 November 2005. CS1 maint: Archived copy as title (link) CS1 maint: Unfit url (link) (in Russian). ^ Thomas, Gary (16 February 2006). "New Report Paints Grim Picture of Uzbekistan". Archived from the original on 25 August 2009. Retrieved 1 June 2016. . Voice of America. ^ "Business Corruption in Uzbekistan". Business Anti-Corruption Portal. Archived from the original on 24 March 2014. Retrieved 27 March 2014. ^ "Uzbekistan: Economic Overview". eurasiacenter.org. Archived from the original on 11 May 2011. Retrieved 2 May 2010. ^ "Press Release: The Republic of Uzbekistan Accepts Article VIII Obligations". Imf.org. Archived from the original on 21 November 2010. Retrieved 2 May 2010. ^ "Asian Development Outlook 2005 – Uzbekistan". ADB.org. 1 January 2005. Archived from the original on 20 November 2010. Retrieved 2 May 2010. ^ "Uzbekistan CPI 2003–2007". Indexmundi.com. 19 February 2010. Archived from the original on 10 May 2011. Retrieved 2 May 2010. ^ "Uzbekistan Bilateral Investment Treaties". UNCTAD Division on Investment and Enterprise. United Nations. Archived from the original on 7 November 2017. ^ "Uzbekistan" (in Russian). The world bank. Archived from the original on 5 June 2013. ^ "the World in 2050" (PDF). HSBC. p. 2. Archived (PDF) from the original on 14 October 2017. ^ Park, Si-soo (18 November 2007). "Ex-Announcer Tops Internet News". Korea Times. Retrieved 22 May 2018. ^ "Население Узбекистана превысило 32 млн человек" (in Russian). Gazeta.uz. 16 January 2017. Archived from the original on 31 January 2017. Retrieved 19 January 2017. ^ a b c d Cordell, Karl (1998) Ethnicity and Democratisation in the New Europe, Routledge, ISBN 0415173124, p. 201: "Consequently, the number of citizens who regard themselves as Tajiks is difficult to determine. Tajikis within and outside of the republic, Samarkand State University (SamGU) academic and international commentators suggest that there may be between six and seven million Tajiks in Uzbekistan, constituting 30% of the republic's 22 million population, rather than the official figure of 4.7% (Foltz 1996;213; Carlisle 1995:88). ^ a b c d Jonson, Lena (1976) Tajikistan in the New Central Asia, I.B.Tauris, ISBN 085771726X, p. 108: "According to official Uzbek statistics there are slightly over 1 million Tajiks in Uzbekistan or about 3% of the population. The unofficial figure is over 6 million Tajiks. They are concentrated in the Sukhandarya, Samarqand and Bukhara regions." ^ a b c Richard Foltz (1996). "The Tajiks of Uzbekistan". Central Asian Survey. 15 (2): 213–216. doi:10.1080/02634939608400946. ^ a b Cornell, Svante E. (2000). "Uzbekistan: A Regional Player in Eurasian Geopolitics?". European Security. 9 (2): 115. doi:10.1080/09662830008407454. Archived from the original on 5 May 2009. ^ Zerjal, Tatjana; Wells, R. Spencer; Yuldasheva, Nadira; Ruzibakiev, Ruslan; Tyler-Smith, Chris (2002). "A Genetic Landscape Reshaped by Recent Events: Y-Chromosomal Insights into Central Asia". The American Journal of Human Genetics. 71 (3): 466–482. doi:10.1086/342096. PMC 419996. PMID 12145751. ^ World Jewish Population 2001 Archived 6 December 2013 at the Wayback Machine, American Jewish Yearbook, vol. 101 (2001), p. 561. ^ "The Russian Minority in Central Asia: Migration, Politics, and Language Archived 6 December 2013 at the Wayback Machine" (PDF). Woodrow Wilson International Center for Scholars. ^ The Russians are Still Leaving Uzbekistan For Kazakhstan Now Archived 11 February 2009 at the Wayback Machine. Journal of Turkish Weekly. 16 December 2004. ^ Agtzidis, Vlasis (1991). "The Persecution of Pontic Greeks in the Soviet Union". Journal of Refugee Studies. 4 (4): 372–381. doi:10.1093/jrs/4.4.372. ISSN 0951-6328. ^ Deported Nationalities Archived 19 August 2014 at the Wayback Machine. World Directory of Minorities. ^ Crimean Tatars Divide Ukraine and Russia [tt_news=35167&tx_ttnews[backPid]=7&cHash=0c1663d799 Archived] 22 March 2014 at the Wayback Machine. The Jamestown Foundation. 24 June 2009. ^ Greece overcomes its ancient history, finally Archived 25 September 2015 at the Wayback Machine. The Independent. 6 July 2004. ^ World Directory of Minorities and Indigenous Peoples – Uzbekistan : Meskhetian Turks Archived 16 October 2012 at the Wayback Machine. Minority Rights Group International. ^ "Uzbekistan: Labor Migrants Looking Beyond Russia". 10 May 2016. Archived from the original on 25 December 2016 – via EurasiaNet. ^ "Islam Karimov: Uzbekistan president's death confirmed". BBC News. Archived from the original on 3 September 2016. Retrieved 4 September 2016. ^ "Численность городского и сельского населения по регионам". The State Comittee of the Republic of Uzbekistan on Statistics. Retrieved 25 January 2018. ^ "Административно-территориальное деление Наманганской области". Портал открытых данных Республики Узбекистан. Retrieved 25 January 2018. ^ "Самарқанд шаҳри". samarkand.uz. Retrieved 25 January 2018. ^ "Количество населения в Андижанской области". Портал открытых данных Республики Узбекистан. Retrieved 25 January 2018. ^ "Число постоянных жителей в Республики Каракалпакстан". Портал открытых данных Республики Узбекистан. Retrieved 25 January 2018. ^ "Численность населения Узбекистана по городам, 2018". poltavareview.com. Retrieved 25 January 2018. ^ "Численность населения Кашкадарьи". Statistics. Retrieved 25 January 2018. ^ "Демографическая ситуация в Ферганской области". Портал открытых данных Республики Узбекистан. Retrieved 25 January 2018. 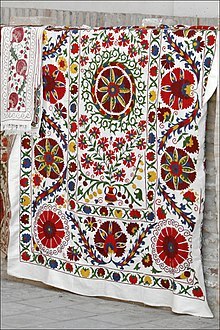 ^ "Middle East :: UZBEKISTAN". CIA The World Factbook. ^ a b "A Country Study: Uzbekistan". Federal Research Division. 1988–98. Archived from the original on 31 August 2013. Retrieved 27 December 2013. ^ "The Rising Islamic State threat in Central Asia". Chicago Tribune. Archived from the original on 3 August 2017. Retrieved 3 August 2017. ^ "Uzbekistan's real problem is not terrorism, it's politics". Politico.eu. Politico. 6 September 2016. Archived from the original on 3 August 2017. Retrieved 3 August 2017. ^ a b c d e "Uzbekistan Archived 12 July 2015 at the Wayback Machine". Jewish Virtual Library (30 July 2004). Retrieved on 29 November 2015. ^ Mansurov, Nasim (8 December 1992). "Constitution of the Republic of Uzbekistan". Umid.uz. Archived from the original on 17 January 2012. Retrieved 2 May 2010. ^ "State Education Portal of Uzbekistan". Ziyonet. Government of Uzbekistan. Retrieved 26 August 2018. ^ "President's FaceBook". FaceBook. Retrieved 26 August 2018. ^ "Presidential Site of Uzbekistan". President.uz. The Government of Uzbekistan. Retrieved 26 August 2018. ^ А. Е. Пьянов. "СТАТУС РУССКОГО ЯЗЫКА В СТРАНАХ СНГ". 2011. Archived from the original on 28 May 2016. Retrieved 27 May 2016. ^ "Uzbekistan's Russian-Language Conundrum". Eurasianet.org. 19 September 2006. Archived from the original on 29 November 2010. Retrieved 2 May 2010. ^ Richard Foltz (1996). "The Tajiks of Uzbekistan". Central Asian Survey. 15 (2): 213–216. doi:10.1080/02634939608400946. ^ Kamp, Marianne (2008). The New Woman in Uzbekistan: Islam, Modernity, and Unveiling Under Communism. University of Washington Press. ISBN 978-0-295-98819-1. Archived from the original on 5 April 2015. ^ TeleSonera AB acquires Coscom Archived 8 June 2010 at the Wayback Machine, UzDaily.com, 17 July 2007. Retrieved 18 January 2009. ^ a b Uzbekistan profile – Media – BBC News Archived 21 August 2013 at the Wayback Machine. Bbc.co.uk (27 November 2014). Retrieved on 29 November 2015. ^ "Uzbekistan, General Motors sign strategic deal". Uzdaily.com. Archived from the original on 16 May 2011. Retrieved 2 May 2010. ^ SamAuto supplies 100 buses to Samarkand firms Archived 27 September 2007 at the Wayback Machine, UZDaily.com. Japanese firm buys 8% shares in SamAuto Archived 27 September 2007 at the Wayback Machine, UZDaily.com. ^ First high-speed electricity train carries out first trip from Samarkand and Tashkent, 27 August 2011 Archived 11 January 2012 at the Wayback Machine. Uzdaily (27 August 2011). Retrieved 19 February 2012. ^ "Uzbekistan quits Russia-led CSTO military bloc". 28 June 2012. Archived from the original on 2 May 2013. ^ Marquardt, Erich and Wolfe, Adam (17 October 2005) Rice Attempts to Secure US Influence in Central Asia Archived 3 May 2012 at the Wayback Machine, Global Policy Forum. ^ "Le Tours archive". Archived from the original on 11 January 2012. Retrieved 23 August 2011. ^ "Uzbekistan's new Olympic Light Flyweight Champion Hasanboy Dusmatov wins the Val Barker Trophy for the outstanding male boxer of Rio 2016". AIBA. Archived from the original on 23 August 2016. Retrieved 21 August 2016. ^ "AIBA celebrates 70-year anniversary with Gala Dinner in the company of Boxing Legends". AIBA. Archived from the original on 24 December 2016. Retrieved 21 December 2016. 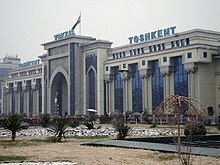 UNDP & Chamber of Commerce and Industry "Export Guide for Uzbekistan"
Wikimedia Commons has media related to Uzbekistan. Wikivoyage has a travel guide for Uzbekistan. This page was last edited on 22 April 2019, at 08:12 (UTC).